First off, congratulations! Please take a moment–or several–to enjoy your accomplishment! I know I did. 🙂 Once you’re through basking, though, you might wonder, “What’s next?” Obviously, you want to promote your new book, and one of many ways to do that is to hold a book signing. A book signing can take place at a bookstore, library, church, school, or any other location that has ties to your subject matter, such as a seminar on saving for retirement (if your book happens to include savvy financial advice) or a fundraiser for cancer research (if your book is focused on stories of cancer survivors). A book signing can be a nonprofit event, a for-profit event, or something in between. The choice is yours. Once you’ve decided what type of book signing you want to do and where you’d like to do it, the next step is to write a proposal outlining your plans, and submit it to the venue you hope will host the event. That’s where this blog post comes in. So I went home, hopped online, and did a search for “how to write a book signing proposal.” Given that there are ten BAZILLION examples of how to write query letters and cover letters and synopses and summaries and log lines and outlines and everything else a writer could possibly need to know in the business, I figured I’d find what I needed right away. W-R-O-N-G. I found absolutely zero examples of how to write a proposal for a book signing event. That’s right, not ONE. It didn’t even seem to be a real thing. “A book signing proposal? What’s that?” the Google page seemed to ask, its digital eyebrows quirking in confusion. Apparently, I was on my own. So, I looked up everything I could about writing other types of proposals. Most of what I found didn’t apply to my situation–I was a writer trying to land a book signing, not a construction company trying to undercut my competition’s lumber prices in order to win a contract. Eventually, I managed to skim the microscopic amount of actual, useful advice from the overwhelming river of info, and used it to create my own proposal, which I will share below. Greetings! My name is Gretchen Bassier, and I’m a local author interested in using my writing to give back to my community. This summer, two of my nonfiction stories were published in the books Chicken Soup for the Soul: The Cat Did What? and Chicken Soup for the Soul: The Dog Did What? 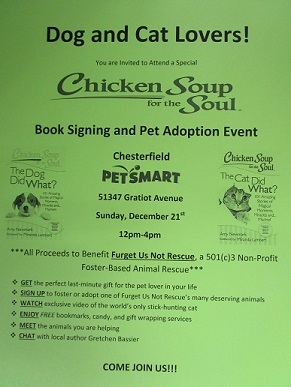 I would love to do a book signing to benefit an organization that cares about animals as much as I do. If I purchase the books myself, then for each book sold at the fundraiser, I would receive the initial price I paid – $7.50 – and your organization would receive one hundred percent of the profits. After the signing, I would take home any unsold books for use at future events. Alternately, if your organization purchases the books, then any unsold copies would remain with you, to be sold at future events and/or in your gift shop. I would, of course, do the book signing at no cost to you. A book signing fundraiser would probably work best in conjunction with another event, such as a dog walk, golf outing, a vaccine clinic, or an adoption day. People already planning to attend the event will have an additional way to help out your organization (by buying a book – or two! ), and the inclusion of the book signing might also draw in some people who wouldn’t otherwise have attended. If I were holding a book signing at one of your events, I would promote the signing with flyers in the weeks leading up to the event, reach out to local media to help publicize the event, and have my publicist advertise the event on Facebook and Twitter. On the day of the signing, I would arrive at least half an hour before the start time and bring: a table, a chair, a tablecloth, markers and pens, business cards, a bowl of individually-wrapped mints, bottled water, display stands for the books, the books themselves (if I was the one designated to purchase them), and most likely a stack of bookmarks featuring the animals from my stories (to be used as a giveaway). If you are interested in having me hold a signing at any of your future events, please let me know so I can have everything ready well in advance. Thank you for taking the time to consider my proposal, and I hope to have the opportunity to work with you and raise some money for our beloved critters! Thanks in part to the above proposal, I have now held two book signings to benefit Furget Us Not Rescue (go check out their adoptable animals!). I had a great time at both events, and I will have another post detailing what I learned from my first two book signing adventures. Not so hard, right? Just keep it simple, professional and informative, and I guarantee you’ll make a good first impression. Also, don’t forget to have FUN–you’re doing this to celebrate your new book. Cherish the moment, and all of the opportunities that go along with it. 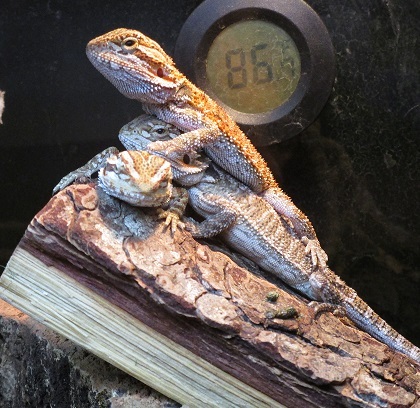 Example of what happens when you let a friend borrow your camera during your book signing at PetSmart: random lizard pics! So, hopefully now you know how to write a book signing proposal, to whom it should be addressed, and what should be included along with it. You even have a concrete example to use as a guide. So, what are you waiting for? Get your packet prepped, and get ready to sign some books!